In two weeks time, I will be giving a public lecture for LGBT History Month at an event in London, celebrating the RCN’s role in championing diversity. 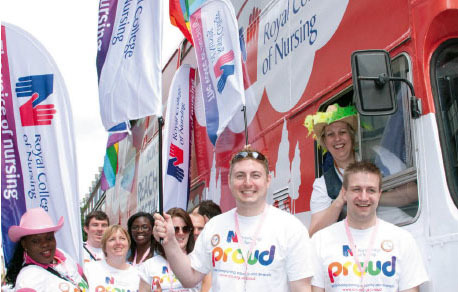 Over the years, the RCN has fought for gay, lesbian, bisexual and trans (LGBT) rights and participated in Pride events across the UK, which means more than just marching and having a stand; it is a clear demonstration of the college’s commitment to patient care, equality and recognising LGBT health workers. At RCN congress in Brighton in 1988, activists unfurled a banner in the congress hall calling on the RCN to challenge Section 28, which banned local authorities from ‘promoting’ homosexuality or portraying it in a positive light in schools. This can be seen as the start of the RCN’s journey with LGBT nurses and patients. Over the years, a number of key debates have taken place at congress, moving the LGBT agenda forward professionally and politically. The theme for congress in Bournemouth in 1998 was ‘Change and Challenge’. An emergency resolution about children and adolescents who had been bullied because they were lesbian or gay was accepted onto the agenda, and a huge majority of delegates voted to lobby the government to provide clear guidance and support to tackle homophobia and related bullying in schools. With school nurses taking the lead and supporting this and other resolutions on equality in the age of consent, the RCN’s credibility on promoting and recognising the health needs of LGBT people started to grow. Publications about caring for LGBT patients and partners have been produced by the college, leading the way in developing patient care. The RCN London OUT! group formed in 2001, bringing together members across London to discuss participation in Pride events and support for nurses. Then in 2003 the RCN joined the march at London Pride, and for a couple of years had stands at Pride events. RCN Proud launched a few years later, with the college participating in Pride events across the UK. This was about the RCN visibly supporting LGBT rights, and it led to closer working with the Gay and Lesbian Doctors and Dentists Association and the wider gay community. The few of us who marched in 2003 were waved off from Cavendish Square by RCN council members. By the end of the march, we had been joined by more than 50 nurses, midwives and nursing students. The RCN made history that day as the first royal college to march in a Pride event – we were prepared to join with other organisations to support gay rights. As we celebrate LGBT History Month, it is time to reflect on the success and progress achieved over the years, but also to remember there is still a long way to go in tackling homophobia in healthcare settings, promoting the rights of LGBT people and eliminating discrimination. This year, the RCN will be participating in Pride events all over the country. Think about joining us and be proud of what the RCN has achieved.